since that revelation, those words have been buzzing around my head. does a pictures really say a thousand words, or will one or two suffice? its so much harder to say something in five words rather than ten, which means i am unconsciously filtering, distorting, metamorphosing my inadequacies and prejudices, babel-fishing until the talking picture is something i can understand. a picture talking to me is like me talking to another human being - you are never quite sure if you got it all, got it right or are even on the same wavelength. when im looking at pictures (and i guess we all do this as humans) im searching for points of similarity and recognise-ableness: the more i find, the more i like it. but what happens when you recognise… nothing? 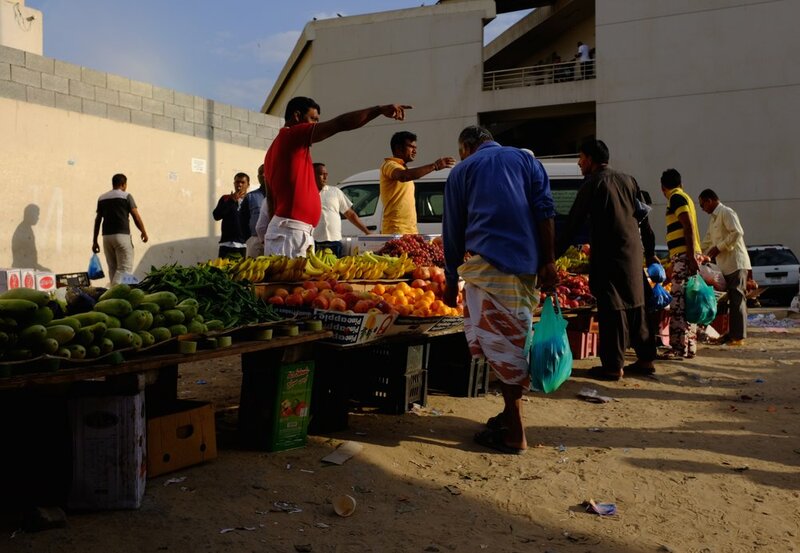 every Friday in the industrial area in Dubai, the blue collar workers set up a bustling market where they sell fruits, vegetables and household goods, alongside little food stalls. i was there with a group of photographers, all male and all white (this is not a racist statement but an important fact). the market was busy with men shouting their wares, catching up with friends, purchasing, bargaining furiously, eating and doing all the things one would expect in a plein-air market. except this wasn’t some sweet little spot in france, this was rough and dirty with the lowest income workers in the country. i didn't have rose-coloured glasses going in, but i never expected to feel what i did. the dirt, noise and heat didn’t bother me. what did bother me was i was the only woman there, i was brown and my camera equipment was equivalent to six months wages of one of the workers. the first point got me curious, baffled, leering looks. the last point made me feel ashamed, guilty and privileged. the point in the middle meant i stuck out like sore thumb, even though i was surrounded by people the same colour as me. i barely managed two pictures (secretly) and then hid my camera under my arm, lowered my head and eyes and walked as quickly as i could through the market. i wasn’t in any danger and no-one spoke to me, yet i felt like i was wearing the emperors new clothes. i really wished i wasn’t there. i don’t have a rational, conscious reason for feeling what i did and i still haven’t been able to fully understand it.